The Austin Board of Realtors recently released the finalized statistics for March 2013 which now gives us a complete look at the Austin real estate market for the first quarter (Q1, January – March). This is a quick look at how Q1 compares to the same time period last year and an update on the Austin market as a whole. In Q1 of 2013, 2736 homes sold within the Austin city limits. This represents a 20.3% increase versus Q1 of 2012, when only 2275 homes were sold. The average sales price in Austin also grew 8.6% to $321,912 and the average price per square foot rose 10% to $159.50. While prices rose, the average time it took a house to sell in Austin declined 28.8%. The average home in Austin sold in 52 days, 21 days less than during the same time period in 2012. While the data from home sales give a clear picture of the strength of the Austin market, the number of active listings shows that these trends will likely continue for the foreseeable future. 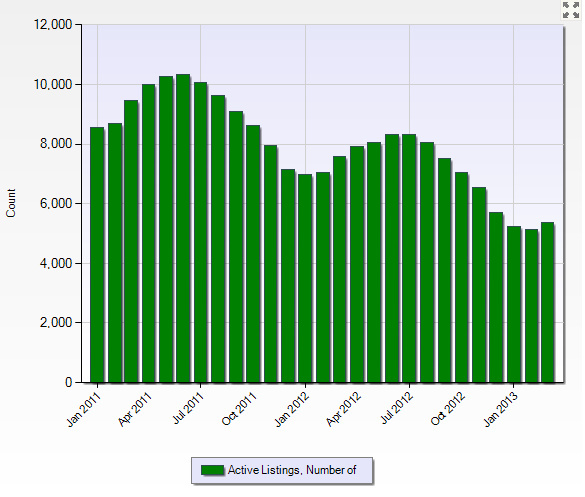 The number of homes for sale in Austin was only 5355 in March. This is a 29.5% decrease versus 2012. With over 1200 people moving to Austin every week, demand continues to strengthen and is driving prices even higher as available inventory continues to shrink. This graph is shows the long term trend in Austin. Though the overall market is very strong, home values and market activity can change from subdivision to subdivision or even street to street. If you are considering selling your home this year, drop me a note and we can discuss the value of your home and how I can help you get the most equity possible as you look to move out or move up to another home. I feel like we’ve turned a corner in the Austin economy and optimism is starting to spread. Hopefully, we’ll see positive growth in Q2 as well. If April is any clue, it will be VERY strong!